This post has been a long time coming, so, better now then, well, later! In mid June, my nails were in crisis mode. How they got to that state, I have no idea, I had not really changed anything with, well, anything. Yet my nails were straight from some demonic possession movie. They were splitting, chipping, infected, angry. Basically they were disgusting. Late June, I was mentioning it to my coworkers.. and low and behold, not even 2 hours later, I had an e-mail from a rep at Nail Polish Canada asking me if I wanted to review Duri Rejuvacote, and I quote: "Duri Rejuvacote is an award-winning nail growth treatment that's known to heal split, cracked, damaged nails within a few weeks. 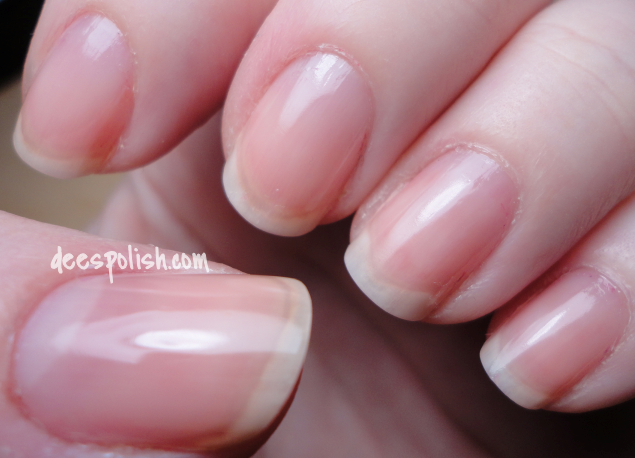 It helps you get naturally strong, healthy nails and can be applied as a base coat or top coat." It was almost as if I had some sort of wire on.. these were the exact problems I had just been complaining about. Of course I immediately fired an e-mail back saying I would happily give it a go. When I got home that evening, I did a little investigating on this product. It had pretty good reviews, and some of the negatives really stuck out to me: it smells terrible and it stings. One review in particular said that it burned until she removed it. I was a little scared. I did a little further investigating and found that it is not 3-free, so that went with why it had a harsh smell, and probably why it might sting as well. I was still excited to give it a go. I mean, worst case scenario: it really burns and I don't use it. When it arrived, I was suuuuper jazzed! Time to whip my ridiculously horrendous nails in to shape! This was them on my first application. I figured to give this an honest go, I would just keep my nails as the snapped off shorties that they were. AND! To my extreme surprise.. there was no burning. A little bit of a smell, meh, no biggie.. but I had my teeth bared just waiting for a sharp inhale from the excruciating pain that was about to befall my sweet baby digits.. and.. nada. I applied, and turned out the lights. Twas a good time! Week 2.. I didn't take a photo as there was not too much of a change.. though my nails were just strong. I cannot really capture the strength of my nails in a photograph - sorry - but believe me, they were feeling great! 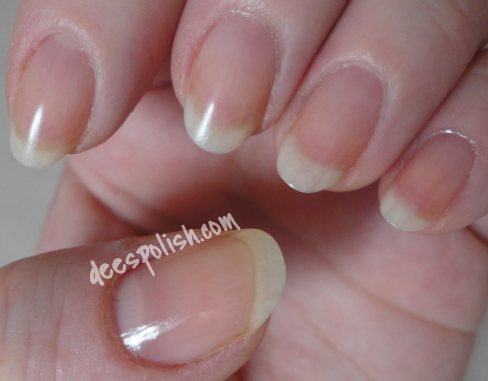 Week three.. some sweet growth, extra strong nails, annnd extremely dry cuticles! Now, I am someone that regularly has super dry cuticles, but this was probably 10x worse. I stopped using cuticle nippers many months ago, but I had to do a little nipping here.. they were lifting around my nail bed and just looked nightmarish. I am not sure if it was due to using this product, or the heat wave we were experiencing. I just rolled with it all because my nails were back to being strong like they have my whole entire life up until this past June. This is week five/how my nails currently look. My nails grow quite quickly as a general rule, but now they are long and super strong! Strong enough for me to actually get to play with my nail shape. I usually don't mess with it as when I normally do, my nails will be like 'yeah, no, snap' and I restart. I am sort of doing some sort of almond-y shape. I really like it! And I have been sporting it for over a week with no problems. Fantastic if you ask me! To me, this product is a complete gem! Sure, the not being 3-free thing isn't the best (I read somewhere there is a 3-free version..), but I can get past that as the results have been exactly what I wanted. I just put it on every other time I polish my nails and the strength remains. I could not be happier! If you happen to be in a similar boat that I was in, please do not hesitate to give this product a whirl! It saved my nails in their moment of weakness!! Go scope it HERE on the Nail Polish Canada website.. and maybe some other goodies when you're there.. I mean.. it is nail polish, after all.